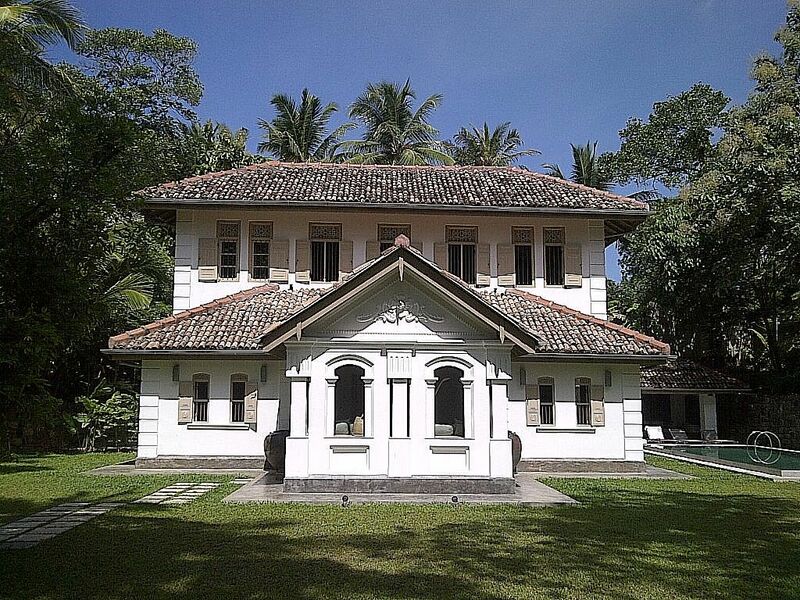 Old Clove House is a traditional Sri Lankan house that has been fully renovated, restored and modernized. Old Clove House is located in a lush garden of more than half an acre with an expansive lawn, mature trees and shrubs. Its walled all around by an 8 feet high perimeter wall ensuring total privacy. A standalone dining pavilion which seats 8 adults comfortably overlooks the 32 feet long swimming pool. The house is designed to maximise outdoor living perfectly suited to the warm climate of Sri Lanka. There are three bedrooms - the upper level master suite with a king sized bed, the poolside room with a king sized bed, and the children's room with a queen sized bed and two single beds. The house sleeps 8 adults comfortably but with converted daybeds and bunk-beds, up to 10 can be accommodated. All bedrooms can be cooled by air-conditioning or overhead ceiling fans. All bedrooms are en-suite with hot water showers. Two cots can be made available and the house is very children friendly. The smaller cot is suitable for an infant while the larger cot is suitable for a young child up to the age of 3. Massages can be arranged in house at our massage room, and private yoga classes can be taken on the lawn or in the house. I am the manager of Old Clove House and I am local to this village. I manage the house and take care of all needs of guests during your stay here. You can depend on me to arrange for transportation to and from the house, purchase all your provisions for your meals, make reservations at restaurants, suggest places of interest for you to visit, arrange excursions and daytrips further afield and whatever else to make your stay at Old Clove House an amazing one. I also manage the household staff who will ensure that the standards of housekeeping is perfect at all times. I really enjoy meeting new people and love my job and am happiest whenever guests have a really wonderful stay at Old Clove House. I look forward to welcoming you to Old Clove House. The house was a derelict mess when I first saw it but I loved the neighbourhood, being so green, peaceful, tranquil and quiet, and yet so close to the beautiful beaches of Thalpe and Unawatuna, and to Galle Fort. After purchasing the property, the long process of renovations began and this really meant taking the roof down, stripping the entire house down to its bare bones - all wiring, plumbing, plastering and flooring had to be redone. Walls had to be taken down to make the rooms and spaces larger and totally new en-suite bathrooms built as the old house only had an outhouse. The kitchen also had to be built as the old kitchen was again, in an outhouse. It was a challenging process renovating and modernizing it but I'm very proud to have given it a new lease of life. The house has great character, and is an extremely comfortable space to be in. The floors being polished terazzo, stays very cool even on the balmiest of days. The muted neutral deco blends in beautifully with the lovely lush and green garden. There is a lot of natural light in the house, with the main central reception lit by an overhead skylight during the day. The spaces flow into each other seamlessly. There are lots of very comfortable sitting areas, both communal and private and the spaces have been designed to maximise the potential of indoor-outdoor living that's perfectly suited to the warm climes of Sri Lanka. There is a lot of natural ventilation and added ventilation provided by overhead ceiling fans, and air-conditioning if required. There are three bathrooms, and all bedrooms are en-suite. All bathrooms have hot water showers and the showers are open to sky, perfect for the tropical Sri Lankan climate. There is high-speed WiFi connection, with satellite TV offering all premium channels and the latest Bose SoundLink Bluetooth Speaker III which guests can stream any music of their choice from any of their smart devices. There is an in-house cook who will prepare all meals for guests as required. We take great pride in the high standard of the meals served at Old Clove House and endeavour to provide our guests with a very memorable dining experience. Notes on accommodation: Guests are expected to treat the house as they would their own. The staff is highly valued and work very hard with integrity and honesty and we only expect that they are well tipped if guests are happy with their service. Previous guests have been extremely happy with the dedicated service of this hardworking team. All food and beverages prepared and consumed at Old Clove House are at cost with no mark-ups. Old Clove House is your home for the duration of the rental and you are not expected to pay any more for food and drinks consumed than when you're at your own home. Old Clove House is located in the village of Mihiripenna which is a very pleasant, green and quiet Sri Lankan village. There are increasingly more holiday villas and boutique hotels such as The WHY House in the immediate neighbourhood. Thalpe Beach is approximately 1km away, a very pleasant 10 minute stroll away. Unawatuna Beach is also very easily accessible by tuk tuk. Outside: Old Clove House is located in a lush garden of more than half an acre with an expansive lawn, mature trees and shrubs. Its walled all around by an 8 feet high perimeter wall ensuring total privacy. A standalone dining pavilion which seats 8 adults comfortably overlooks the 32 feet long swimming pool. The house is designed to maximise outdoor living perfectly suited to the warm climate of Sri Lanka. Cleaning / Towels / Linen / Maid service: The head houseboy and two additional younger houseboys attend to housekeeping duties, guests' welfare and will also assist with guests' laundry if required. Towels and linen are changed every 4 days or as required by the guests. Old Clove House is a bit special ! The actually itself house is quite stunning , classically and elegantly furnished , lots of space , with beautiful bedrooms and quirky but lovely outside showers , set amongst green lush mature gardens with monkeys scampering around in the trees surrounding you. A excellent well maintained pool , set at the perfect temperature to come back to after a spell on the beach ...which is only a short Tuk Tuk ride away. The beach unlike most in Sri Lanka is very child friendly being sheltered by a reef so is very safe and allows children to play unhampered by the crashing waves so common in other areas. Tai is a very easy going attentive host , offering advice on local options and ensuring your stay is trouble free and enjoyable. The Food is fantastic ! And we happily ate in every evening and enjoyed the lovely surroundings , the beers and good company ....Why go out ? You can choose from an extensive menu and the food is brought in fresh , cooked and served each day all at cost price ! If your looking for something very special ...don't hesitate to book Old Clove House ! Thank you very much for your lovely review and we’re all really happy that you all enjoyed your stay at Old Clove House. It was lovely having all of you at the house and we very much look forward to welcoming all of you back to the house in the future. A beautiful house in a stunning setting. We spent a delightful two weeks at the Old Clove House. The photographs do not do justice to this beautifully renovated house and gardens. The décor is stunning and the house and lovely garden provide a luxurious oasis of calm. Tai and his team catered brilliantly for our whole family's needs - from anticipating refreshments, to providing sensational food, to organising trips and even purchasing novels! It is worth emphasising the quality of the food cooked by new chef Buddikka which was far better than any restaurants locally - absolutely fantastic! Nothing was too much trouble and hence we felt totally relaxed. Can't wait to return to the Old Clove House and chill again. Old Clove House is one of those places that tempts you - to keep it to yourself because it's so beautiful. Set in lush, green grounds, it's a gorgeous villa that has you saying "wow" from the moment you enter. The rooms are spacious and tastefully decorated. I stayed in the bright and airy top floor room/suite which I loved, with its wooden floors, four poster bed, and fantastic indoor/outdoor ensuite shower. In fact, the whole house has an effortless indoor/outdoor feeling. Tai and his staff are discreet and work hard to make sure that your stay is everything that you wish. The meals were delicious and all prepared (to order, if you want) with ingredients bought fresh from that day's market. There is a tuk tuk and driver available for use by guests should you wish to go to the beach or visit nearby Galle or Unawatuna, although you could just as easily spend the day at Old Clove House, lounging by the side of swimming pool. Make no mistake, Old Clove House has it all. This is truly a gem of a place. Thank you so very much for your lovely review of Old Clove House. It was really lovely meeting you, and welcoming you to Old Clove House and I'm really glad and pleased that you had a lovely stay. I really hope to be able to meet and welcome you, your family and friends back to Old Clove House. All the very best wishes and regards. Thalpe Beach is approximately 1km away, a very pleasant 15 minute stroll or an easy 2 minute tuk tuk ride away. Unawatuna Beach is also very easily accessible by tuk tuk. Dewata Beach, a calm sandy protected bay is just 10 minutes away and is a great place to take surfing lessons. There are good restaurants and bars, and nightlife at Thalpe and Unawatuna Beach. The surfing beaches of Weligama, Mirissa and Ahangama are approximately 30 - 45 minutes away by tuk tuk. The international airport in Colombo is approximately 2.5 hours away and airport transfers can be easily arranged by Old Clove House for our guests. Most of our guests have been very happy to be based at Old Clove House and to use this as a base to explore the attractions in and around Galle. An excursion to the Yala, Uda Walawe or Bundala National Park for safari rides and birdwatching can be easily arranged as a daytrip from Old Clove House. Galle Town and the UNESCO World Heritage listed Galle Fort is approximately 7km away, or an easy 15 minute tuk tuk ride away. The beautiful beaches of Unawatuna and Thalpe are just a 2 - 5 minute tuk tuk ride away. The beautiful Lunuganga Estate is about an hour away. There is are banks in Galle town that dispense cash at their ATMs on international networks and there are a few good supermarkets in Galle town. Our cook will normally do the purchasing for all of our guests and it is an interesting experience for our guests to accompany our cook on these purchasing trips to get a flavour of the local activities at the local markets. Booking Notes: Any booking is to be confirmed by a payment of a 50% deposit into the owner's account and the balance of the payment is to be made one month prior to the arrival date. Changeover Day: We do not have any set arrival or departure times and try to be as flexible as possible to accommodate our guests requirements. In the event of back to back arrivals and departures, we require guests to check out at 10am and to check in at 2pm.